Front (from left): Maritza Bostic, Adena Walker, and Rachael LeBlanc. Back (from left): Alexander Cox, Tom Rash, Sean Crosley, and Colin Budzyna. 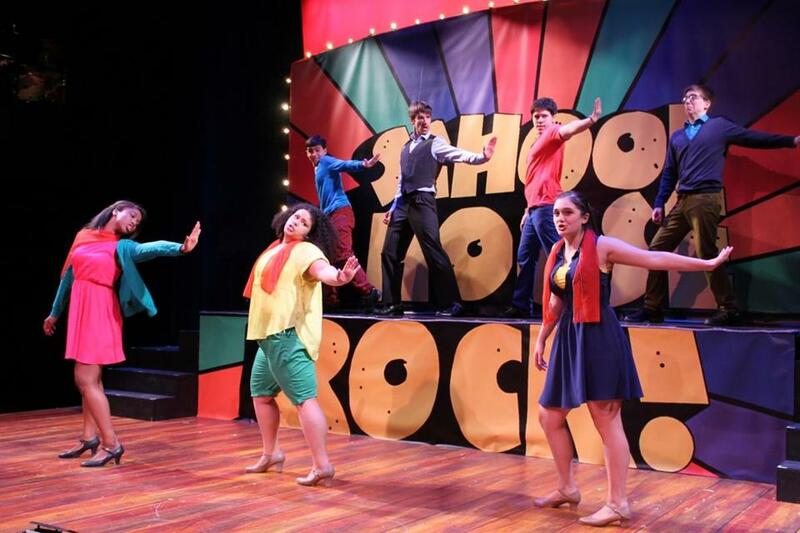 Spirited performances by the Boston Children’s Theatre ensemble make its production of “Schoolhouse Rock Live!,” now playing at the Roberts Studio Theatre, a perfect treat for the 5- to 10-year-old set and their Gen X parents. The musical revue features selections from the dozens of songs written for “Schoolhouse Rock,” a series of short, animated, educational films that ran on Saturday morning TV in the 1970s and ’80s. Besides explaining that “Three Is a Magic Number” and introducing “Interplanet Janet” as she explored the solar system, the broadcast version of “Schoolhouse Rock” turned lessons about the circulatory system and the Preamble to the Constitution into catchy pop tunes with easy-to-remember facts and figures. The best part of this production, though, is the performers — both the onstage singer-dancers and the offstage band. Maritza Bostic, Colin Budzyna, Alexander Cox, Sean Crosley, Rachael Le­Blanc, Tom Rash, and Adena Walker shift seamlessly from one song to the next, stepping into the spotlight and then fading back into the ensemble, while the five-piece band, led by music director Matt Stern, keeps the tempo upbeat and entertaining. The story that links the songs centers on a teacher (Rash) nervously preparing for the first day of school. The rest of the company functions as parts of his subconscious, each vying for attention and encouraging him to use music and imagination to teach his students. Once Bostic warms up the crowd with “A Noun Is a Person, Place or Thing,” the show just rolls merrily along. Although each performer has a standout moment, Bostic’s clear, powerful voice serves as the leader, while Walker adds some extraordinary vocal flourishes and Crosley pulls out the stops with character acting. Director Burgess Clark gives each actor the opportunity to develop a distinctive style or characterization, while choreographer Ali Struyk’s simple steps keep everyone moving. Although the original version of “Schoolhouse Rock Live!” featured 21 songs, Clark limits the number here to 12 without taking away from the fun of the show. At the performance I attended, the youngest audience members were dancing in their seats while their parents quietly sang along. The only element missing from this production was the opportunity for a full-fledged singalong. It wouldn’t have taken much to get the crowd to jump in.